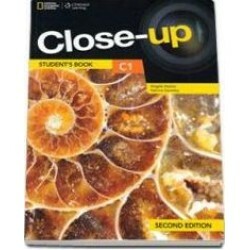 Interesting, topical and up-to-date, Close-Up is a five-level course A2 / C1 which makes English come alive through spectacular National Geographic photography and facts carefully selected to appeal to the inquisitive minds of young teenagers. Thematically-based, Close-Up provides a plethora of interesting and diverse reading texts guaranteed to appeal to this age-group, while providing a springboard for the development of language skills required to communicate effectively about the world around us. Interesting, topical and up-to-date, Close-Up is a five-level course A2/C1 which makes English com.. Interesting, topical and up-to-date, Close-Up is a five-level course A2/C1 which makes English.. Interesting, topical and up-to-date, Close-Up is a five-level course A2/ C1 which makes Engl..